The 28th Chichester Priory 10k was a huge success as course records were broken in a super-fast race involving well over 1,400 athletes. Goodwood motor circuit hosted the start and finish of a race that was every bit as special as last week’s Observer preview predicted it could be. Organisers, athletes and spectators were delighted with perfect conditions as they arrived early on Sunday. After the bleak previous few days, the sun shone and although it was cold and at times a little breezy, it was an ideal day for running – as the finishing times were to show. The quality of previous years’ races resulted in another very good turnout of elite, club and recreational runners for one of the most popular and prestigious races in the south and an integral part of the English road-running calendar. Many achieved personal bests, and some running for the first time commented on how much they enjoyed the course, the scenery and the iconic Goodwood finish. To help the runners beat the cold, Simon Webster of Goodwood Health Club led a group warm-up session before the start. At 9.30am, a starting party including the president of Chichester Priory Rotary Club, Gordon Jones; Christopher Doman, founder president of the Rotary Club, and Chichester District Council chairman Cllr Elizabeth Hamilton, a great supporter of sport in the area, set the field on their way. They made an extremely impressive sight as they streamed away from the motor circuit along Claypit Lane, running on public roads for the first 6.5k. They passed the entrance to Rolls Royce, ran along Madgwick Lane to Stane Street, through Strettington and back along New Road – finishing with a lap of the motor circuit. On paper this was one of the strongest fields ever assembled in Chichester. The front-runners set off at a cracking pace and the expectation of something special was soon realised. From an early stage the leading runners meant business and there were some 40 runners heading the main pack. As the runners entered Stane Street a group of nine started to pull away – Will Mycroft of Enfield & Haringey AC, Paul Navesey from Crawley AC, Andy Coley-Maud of Clapham Chasers, Calum Johnson from Bodyworks XTC Tri Store, Peter Le Grice of Bristol & West, Tom Evans of Lewes AC, Dougie Musson of Notts AC, David Long from Bournemouth AC and Joshua Grace of Aldershot, Farnham & District. The lead constantly changed but the pace never slackened for the first seven kilometres. Spectators at the motor circuit were treated to an amazing running spectacle as the leading group turned on to the track. For another 3k they battled it out and with a mile to go Mycroft made a break, taking only Navesey with him. These two increased the gap from the leading group and although Navesey continued to challenge as they headed for the finishing straight, Mycroft took the title by just one second in a time of 29.32 – 13 seconds faster than the course record. Six runners beat the record set last year and seven were within 30 minutes. The women’s race was also of a very high standard with a number of the pre-race favourites acquitting themselves well and battling it out for podium places. Star of the show was Olympian Stephanie Twell from Aldershot, Farnham & District, making her second appearance at Chichester but her first at Goodwood. She was an early leader in the women’s race and initially was kept company by many male runners, although in the middle part of the race she was running on her own. The enthusiasm of the crowd as she entered the motor circuit rejuvenated her and she went on to beat the course record by six seconds in a very fast 33.17. Nearly a minute behind her was clubmate Lauren Hall, second woman home, with Leah Harris of Worthing third – almost another minute back. The 10k was one of three qualifying opportunities for the Age Groups Masters England 10k Championships and the leading vets at Goodwood will don a special England Masters vest at the Great Birmingham 10k in May. As a consequence the standard of the veteran prizewinners was very high. The men’s vet 40 title went to Neil Boniface (Crawley AC) in 31.14. Howard Bristow (Brighton & Hove AC) was five seconds behind. Lewis Sida was first men’s vet 50 home, Paul Mingay of Tiptree Road Runners was first man over 60 and Ron McCullough of Ipswich Jaffa RC was the first vet 70 in an incredible time of 41.53. The Chichester Observer’s Ben Steppel memorial prize for the first local under-23 man home went to Harry Leleu of Chichester Runners – for the sixth time – in 30.51, more than a minute quicker than his time last year. In the men’s team event there were 31 complete A teams representing Hampshire, London, Surrey, Kent and Sussex clubs. The prize was won by the Chichester Runners team of Leleu, Chris Bird and Jo Corbett, who beat defending champions Aldershot, Farnham & District (Grace, James Quinlan and Mike Boucher) by more than a minute, with Bodyworks XTC Tri Store third. The first female vet home was Caroline Hoyte of Arena 80, a previous winner of the Chi race, in 35.47, beating into second Lesley Locks from Hart Road Runners, winner in 2018. Kate Rennie of Dacorum and Tring AC was third with Charlie Metcalfe of Ryde Harriers fourth. 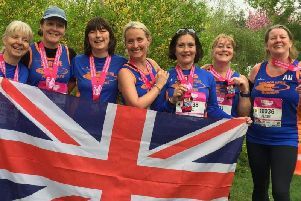 The first female vet 50 home was Elspeth Turner of Horsham Blue Stars, while Helen Dean of Chichester Runners continued her good form of late winning the V60 prize, with Sue Garner of Lingfield RC the first vet 70. Interestingly the first over-65 woman to finish was the race’s second former Olympian – Penny Forse, who as Penny Yule ran for GB in the 1500m in 1976 Olympics in Montreal. In the women’s team event it was business as usual, with the Arena 80 AC team of Maisie Trafford, Caroline Hoyte and Emily Proto defending their trophy against Aldershot, Farnham and District’s Twell, Hall and Lucy Harris, who were second. Worthing and District’s Leah Harris, Sarah Kingston and Anita Sherman were third. The Colin Thorne memorial prize for the first local under-23 woman went, for the third year running, to Alice Cox-Rusbridge in 40.12, more than two minutes quicker than last year. For the sixth year, organisers presented the Henry Adams memorial prize to the person with a special reason for running. The winner was Chris West. Natures Way Foods provided all finishers with an apple and grape fruit bag. Awards were handed out at the prizegiving by a party including the race’s starters and organisers and Pat Adams. Thanks for an enjoyable and successful event went to staff at Goodwood motor circuit, while sponsors including The Run Company, Websitesuccess and Henry Adams were thanked, along with Luckes, Harwoods and Wileys for support with prizes. The winners praised the course, the organisation and the great support and said they planned to return to defend their titles next year.